60 percent of children — as many as 20,000 — displaced by Hurricane Katrina 5 years ago either have serious emotional disorders, behavioral issues or are experiencing significant housing instability according to new report. Five years ago Hurricane Katrina and the flooding of New Orleans caused the evacuation of 1.5 million Gulf Coast residents. 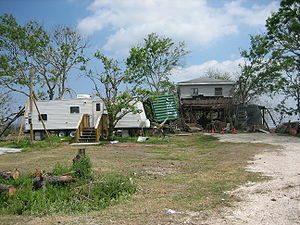 After a year, 500,000 people remained displaced, many residing in highly transitional shelters, including the notorious FEMA trailer parks. Now at the five-year mark, substantial consequences from this prolonged displacement have resulted in widespread mental health issues in children living in the region, according to a new study by the National Center for Disaster Preparedness (NCDP). And this is in the world’s richest country. How will Pakistan recover from its floods ? It may take a whole generation.